The Rudas, a family of Catalan origin, moved to Sardinia in the late 1400s, settling in their feudal holding of Samatzai and later at Donori and Cagliari; they gradually extended their properties in the areas of the villages of Suelli, Soleminis, Guasila, Ortacesus, Villacidro, Villasor, Pauli Arbarei, Lunamatrona, Oristano, Cabras. The title of knights bestowed upon the family and represented by a coat of arms depicting two criss-crossing branches of rue or herb of grace, (from which the name of the family derived), was to be further advanced when the Rudas became Counts of San Lorenzo and Barons of Furtei. At the end of the XIX century, the noble Cavaliere Carlo Vittorio Tordelli, native of Spoleto, in Umbria, married the nable Chiara Ruda. 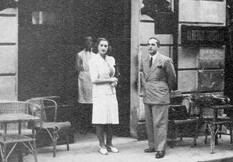 The lineage of the Tordelli family includes civil servants of high rank in the Papal State, and great art collector; in the XIX century, they began with passion a new venture, becoming hoteliers first in Rome and later in their mother-town of Spoleto, were they founded the prestigious "Grand Hotel Tordelli". From the union between Luigi Tordelli, son of Vittorio and Chiara, and Francesca Ruda, Vittorio e Giorgio Tordelli Ruda were born; they soon followed the steps of their family traditions, giving new vigour to the management of their properties, committing themselves, among other ventures, to a thorough and painstaking restoration of their family mansion, the "Casa Ruda" at Suelli. 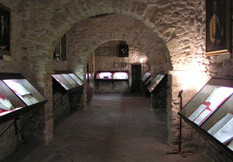 Four centuries after the arrival of the Rudas in Sardinia, in the late 1800s, the wedding of Chiara Ruda with Cavaliere Vittorio Tordelli marked the union of the noble lineage of the Rudas with the enterpreneurial spirit of the Tordellis, a family from the Umbria region of Italy, of noble descent themselves, having among their forebears dignitaries of the papal State, great art collectors and HotelProprietors, including the ownership of the prestigious Grand Hotel Tordelli in Spoleto. The grandchildren of Cavalier Tordelli, Vittorio and Giorgio Tordelli Ruda, the latest descendants and inheritors of the family's traditions, are the authors of the careful and thorough restoration of Casa Ruda. These works, inspired by the wish to preserve the original features of the whole complex, have led not only to the recovery of the original splendour of the ancient Manor House, but have also given life to an attractive museum and to welcoming and confortable reception areas. The complex is articulated in courtyards and gardens, connecting the ancient Manor House to the various dependant buildings; its new lease of life is a strong source of inspiration for the conservation of traditional houses in the ancient villages of the Trexenta and Marmilla districts and Campidano plain. 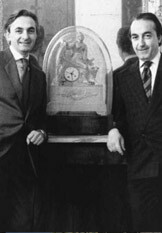 Having completed the restoration works, Giorgio and Vittorio decided to open the house to selected the groups of friends and guests, who are welcomed, now as in the past, with the traditional warmth and hospitality of the country gentleman. 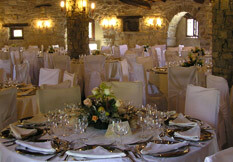 Thus, ceremonies, receptions, gala dinners, complete with all the ingredients which transform a convivial gathering into an unforgettable event: exquisite cuisine, based on the rules of the true Sardinan tradition; faultless and discreet service, careful and efficient organisation and assistance.